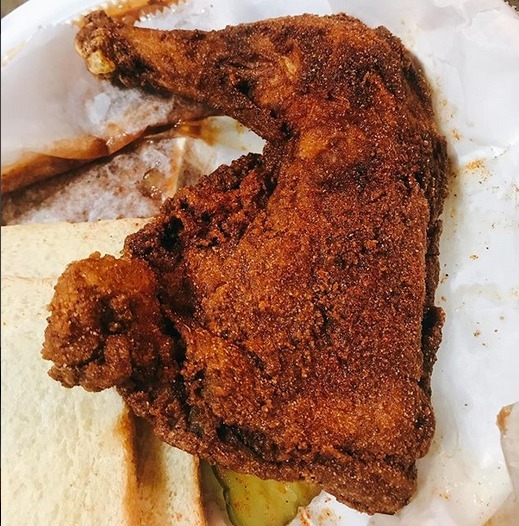 Located at 624 Main Street, Bolton’s Spicy Chicken and Fish was opened in the late 1980s by husband and wife team Dollye Graham-Mathews and Bolton Mathews. Bolton Matthews opened the Main Street location in 1993, making Bolton’s Chicken and Fish among the oldest black-owned businesses remaining on Main Street. Matthews attributes his hot chicken recipe to his uncle, the late Bolton Polk, who operated Columbo's Hot Chicken, another legendary Nashville hot chicken restaurant that was located at the foot of the Shelby Street Bridge. In their kitchen, Bolton continues to use small-scale cast-iron frying, as opposed to fryer-basket systems common in most restaurant kitchens. They also offer pork barbeque, fried pork chops, fried fish, and other soul food staples. Southern Foodways considers Bolton’s a Nashville Food Heritage Site. In late 2018, Bolon Matthews was diagnosed with Stage IV colon cancer. It is not yet clear how this will affect the business’ two locations. At of time of publication, there is a GoFundMe active to allow him to seek treatment. Untitled ~ Source: Bolton's Spicy Chicken and Fish. June 26, 2011. Nooschi, Nashville. Untitled ~ Source: Graham-Matthews, Dollye. "Bolton's Spicy Chicken and Fish All Day Every Day!!!" December 4, 2018. Bolton's Spicy Chicken and Fish, Facebook, Nashville. 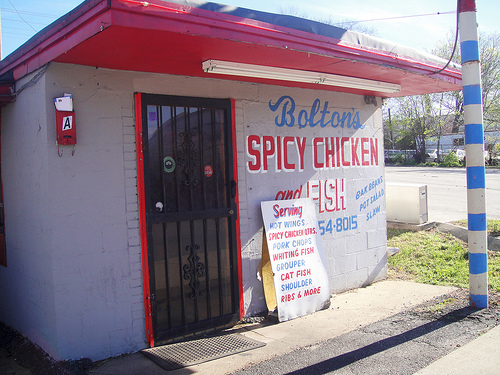 Olivia Pugh, “Bolton's Spicy Chicken and Fish,” Bygone Nashville, accessed April 25, 2019, https://bygone-nashville.mtsu.edu/items/show/42.